Why Does This Website Exist, Again? This website was created as a labor of love to honor all of those with the courage to take a stand against racism by protesting during the national anthem; serve as a repository for significant national anthem protest articles, news, and media; and to provide analysis of and commentary on national anthem protest discourse. There are currently no ads at Courage Under Fire because 1) our founder hates reading articles or going to websites where there are ads all over the place, interrupting one’s website or reading experience; 2) the primary purposes of this site are to honor, inform, and memorialize—not to make anyone a millionaire; and 3) ad space on this site will be very deliberate and dependent on the interested party’s dedication to Black empowerment. That being said, people have asked how they can contribute to the efforts reflected in this venture, which have been extensive and all encompassing. Thousands of hours of have been spent researching, writing, and compiling the uniquely comprehensive information contained on this website, and the work continues by our tiny staff on a daily basis. 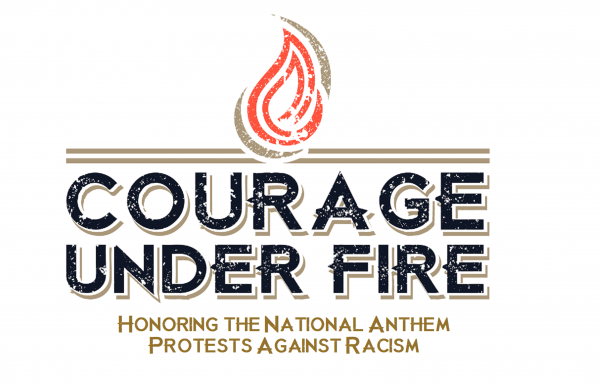 Feel free to contribute to Courage Under Fire, as much or as little as you’d like, on a one time or recurring basis, by clicking the “Donate” button immediately below or throughout this website!! Help us continue to fight racism and honor these historic protests.